Some fresh drivers for Microsoft's newest Surface devices have been pushed out, following hot on the heels of a host of driver tweaks earlier this month. This time around, the driver updates all pertain to the cameras on the Surface Book and Surface Pro 4, both front and rear. So hopefully camera performance should be improved all round, and what's more, Windows Hello – Microsoft's facial recognition system which gives Windows 10 users a biometric option for logins – should benefit as well. These drivers have already rolled out to Windows Insiders on the Fast Ring and Release Preview, as Windows Central reports, and may well be rolling out to the whole user base now – or if they aren't, you can expect them very soon. To check for updates on your Surface device, head to Settings – in the Windows Start menu – then click Update & Security, Windows Update, and then select Check for Updates. 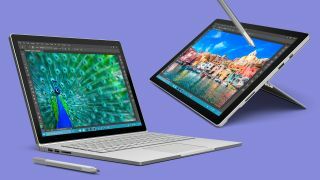 A week and a half ago, Redmond pushed out a round of updates which helped improve the performance of the touchscreen on Surface devices, and also made the Surface Pen a slicker peripheral, with users, for example, observing a big improvement when scribbling in OneNote.